Interested in starting a new career with one of the world’s most iconic brands? At Reyes Coca-Cola Bottling, we are always looking for ambitious and passionate people to join our team. At Reyes Coca-Cola Bottling, we are strongly committed to growing and developing our people. When you join our company, we don’t want it to be just a job, we want it to be the start of a fulfilling career. At Reyes Coca-Cola Bottling, we believe in providing our employees with the tools and information they need to succeed, no matter what their aspirations are within the organization. With Coca-Cola’s extraordinary legacy and our passion to win, the opportunities are endless and your future is bright! When you work for Reyes Coca-Cola Bottling, you are working for a world-class organization. One that is proud to have you on their team, but also one that you’ll be proud to work for. Here, you will have a one-of-a-kind experience of working alongside a brand that is recognized by the global population. Click on the icons below to explore what it’s like to work at Reyes Coca-Cola Bottling. Reyes Coca-Cola Bottling (RCCB) is a proud West Coast bottler and distributor of Coca-Cola brands, committed to adding value to the Coca-Cola supply chain. 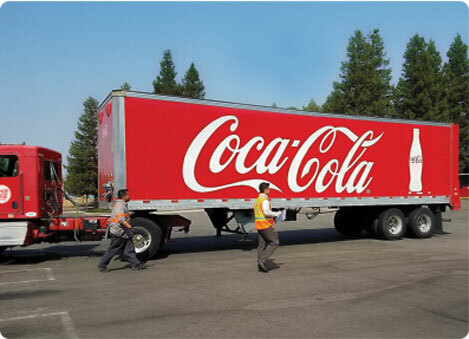 We operate 32 facilities and three bottling plants in two states, California and Nevada, manufacturing and delivering the portfolio of Coca-Cola products to restaurants, sporting venues, businesses, healthcare facilities, schools, convenience stores and supermarkets. Reyes Coca-Cola Bottling joined the Reyes Family of Businesses in 2017 when they were acquired by Reyes Holdings L.L.C., one of the top 10 largest privately held companies in the United States. Reyes Holdings was founded in 1976 with a small Schlitz beer distributorship in Spartanburg, South Carolina by brothers Chris and Jude Reyes. In the past 40+ years, they have grown exponentially into a global leader in the production and distribution of food and beverage products – and today are one of the largest Coca-Cola bottlers in the country. They remain a family-owned business to this day. If you enjoy our products, you’ll really enjoy being a part of our team.